Home Trees and shrubs New South Wales and Queensland African Oil Palm Australian Fan Palm Bauhinia Coast Banksia Black Bean Curtain Fig Flamboyant Flame Of The Forrest Jacaranda Queensland Bottle Tree Queensland Kauri Rainforest tree Rattan Palm Red Cedar Saw Banksia Unknown tree The Flamboyant is certainly one of the most impressive tropical trees - anyway when flowering. 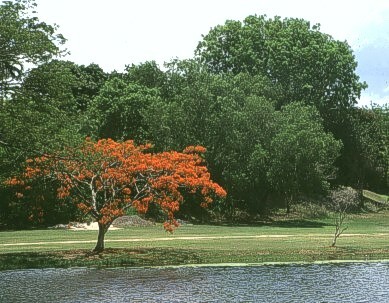 The tree can become quite large and grows in an umbrella-like shape. But in Australia they are quite often smaller than the ones I saw in Polynesia. Maybe it's too dry for them or people cut them down, I don't know. 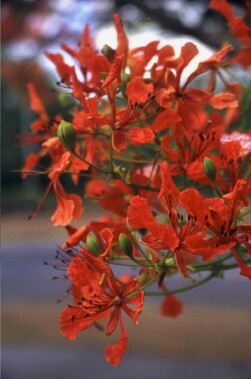 Originally it grows in Madagascar.